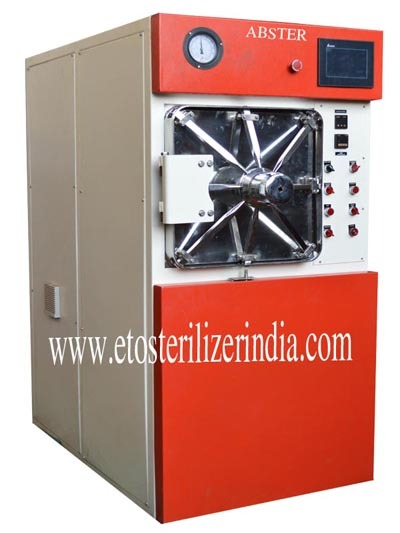 ABSTER is reliable EO sterilizer that provides the latest technological advances in the industry. Specially designed for low temperature sterilization of moisture sensitive equipment. Ethylene Oxide is widely used in the medical industry to sterilize consumables or products. Ethylene oxide (ETO or EO) sterilization plays an important role in an effective healthcare infection control program because of its reliability and gentleness. ETO Sterilizer: Ethylene oxide sterilizers to process sensitive instruments which cannot be adequately sterilized by other methods. EO a potent, anti-microbial agent, can kill all known viruses, bacteria and fungi, annihilating even the most sterilization-resistant types of microorganisms, bacterial spores. Tough on microbes, ethylene oxide still treats most medical materials gently, even with repeated use. The ability to seal items in all plastic packaging permits sterility maintenance for an indefinite period following gas sterilization.